These piers are unparalleled in the support that they offer. Contact Reliable Waterproofing & Masonry to learn more about hydraulic lift slab piers today! 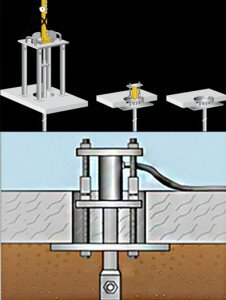 Not just anyone offers hydraulic slab pier solutions, make sure you’re getting the real thing. Our hydraulic lift slab piers are a special type of resistance pier for structures on concrete slabs. These steel slab piers make use of the weight of the slab and encompass the structure to face up to the force of the pier pipe which is pushed to load bearing soil. Leveling concrete slabs was usually done by mudjacking or helical piles. Earth Contact Products has designed a slab pier system and provides foundation repair contractors with another effective solution. The hydraulic lift slab piers use portable equipment in a slab jacking application. The process saves time and money. These hydraulic lift slab piers are used when you have a slab or four or more inches in thickness to stabilize and lift due to failing soil conditions that are too weak to support the slab. They are installed inside the structure through an eight inch, core drilled access hole. The piers install quickly due to their minimal setup time making it a low cost and time efficient method to solving your slab leveling problem. We are your hydraulic lift slab pier experts!